During the Christmas season, Ashbourne is fortunate in that it has many attractions. 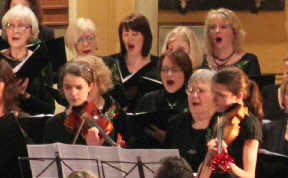 One not to be missed was the annual Christmas Music Concert by the Ashbourne Singers together with the Young Ashbourne Singers. This year, the leader, Linda Perry Smith, appeared before a full house to introduce the audience to what turned out to be a very special occasion. 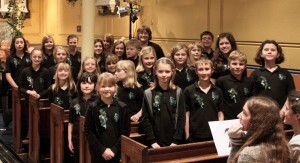 The choirs have both grown in ability and performance over the last few years. This year was to be no exception with a programme which mixed and matched beautifully. The show opened with a very warm and welcoming Deck the Hall, which relaxed the audience into an immediate Christmas mood, probably the generous helping of mulled wine and mince pies on arrival assisted. This was not to be a concert of one carol after another. Two numbers followed in which the singers demonstrated how well the male section had developed and blended as they have added more members. The sound and tone were excellent. The ladies section sang Heaven Knows Why and it was very warmly received. Obviously not every song can be mentioned, but the above should reveal how well things developed. It was after the ladies that the audience had a real treat. The children sang Silent Night. What a revelation. All eyes were glued on the conductor and the quality of the singing was wonderful. The harmony was delightful and the clear, pure voices, rang through the descant, excellent. But more was to follow to cement the progress they have made. 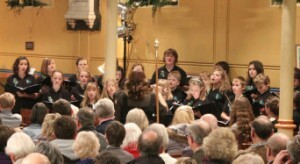 The young singers performed twice more before the interval and maintained the heights they had achieved. The first half closed with a very inspiring mixing together of Pachelbel’s Canon played on two violins by Isobel and Lydia Barber, while the choir sang The First Noel. It was a four-star performance to end the session and again the male voices came through most sympathetically. A great first half and more mulled wine and mince pies in the interval. The second half started with the now traditional Twelve Days of Christmas, when the audience get their chance to show what they are made of and it is very funny. The audience is divided into 12 groups. Each group has to stand when their turn comes. Most groups arrived on time, however, occasionally, the Swans Went A Swimming, the conductor almost losing it, she was laughing so much; great fun. The second half progressed and the two solos performed during In The Bleak Midwinter worked very well indeed. Then a really stunning performance with the choir singing And the Glory of the Lord from The Messiah. Another surprise, a section of the choir came forward and sang two numbers which the talented Steven Duckworth conducted and delivered a very well-balanced and attractive performance. The young singers joined the choir again to sing Mary’s Boy Child, in this instance accompanied by a gentle harmony from the adults which worked perfectly. Everybody joined in Hark the Herald Angels Sing. The choirs then joined together for the final All l Want For Christmas Is You and the concert ended to tremendous applause. One item not yet mentioned because it was very special. Linda Perry-Smith sang Oh Holy Night with such polished clarity and skill that a great cheer went up from all in attendance, including the choirs, the organist Michael Halls, Stephen Duckworth and the excellent Young Singers’ pianist, Melanie Gill. Since their inception in 2007, the Ashbourne Singers, now numbering almost 80, have been carefully moved along, gradually increasing the range and quality of their repertoire. They justly deserved their full house and the tremendous applause from those who attended a very memorable event.